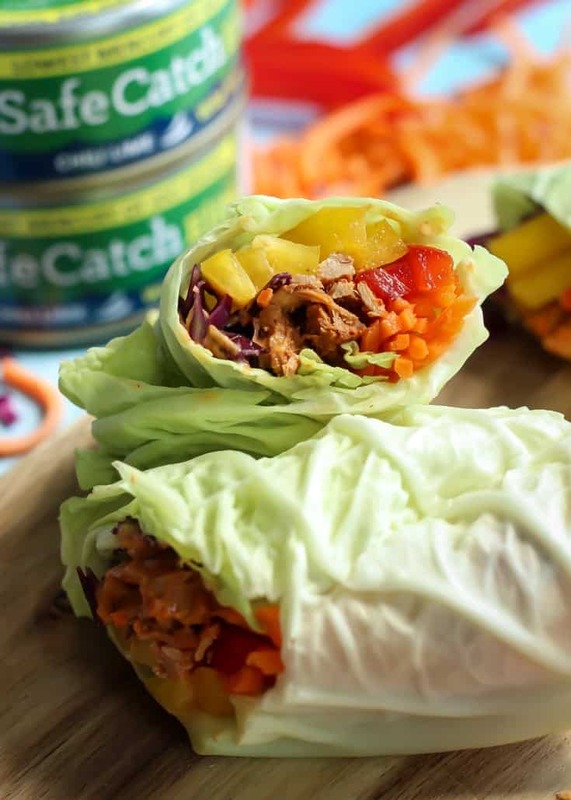 These Chili Lime Tuna Napa Cabbage Wraps are so easy! 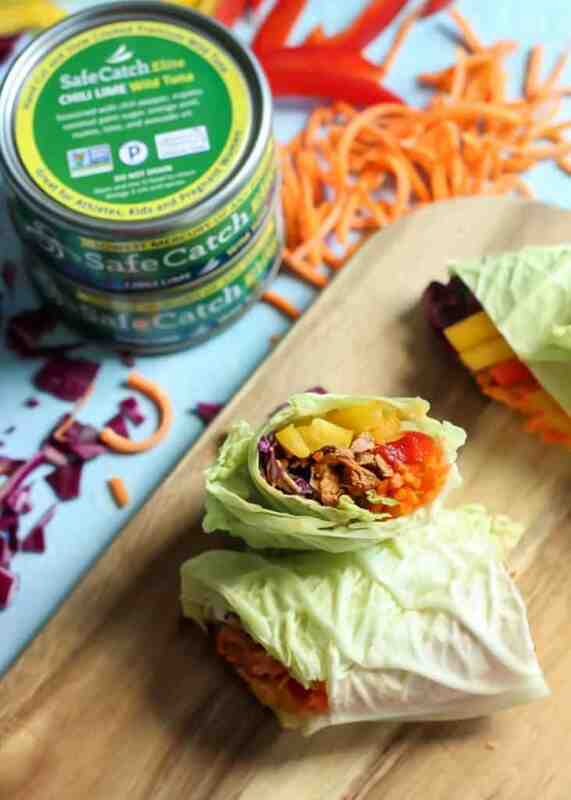 Made using Safe Catch flavored Chili Lime Tuna for a super flavorful and satisfying cabbage wrap. This post is sponsored in partnership with Safe Catch. All opinions expressed, as always, are my own. Thank you for your support as I partner with brands I trust and personally recommend. It helps make Fit Mitten Kitchen possible! You know what is underrated? TUNA. Just getting straight to the point here. Tuna is one of those foods I grew up on. For how picky of an eater I was, I actually did enjoy our weekly “tuna & noodles” – basically just a can of cream of chicken soup, egg noodles and canned tuna. FANCY AF. … that’s it, guys. I kid you not. Does ANYONE ELSE know what I am referring to? I’m not sure if my dad came up with this, or if he learned it from his dad or what. But we did in fact grow up eating canned tuna on buttered toast. I’m actually chuckling to myself just thinking about it. It was a cheap dinner for 6 of us kids, not to mention easy and quick. After traveling to the UK last summer and seeing “toasties” on a lot of the local restaurant menus, I had to wonder if our “tuna toasted” sandwiches were a take on the British toasted sandwiches? Anyways. Tuna has come a longggg way since then! Take the seasoned elite tuna line from Safe Catch. So many flavors and all amazing combinations. I love them all, honestly. And the seasoned tunas also provide a great starting point for creating healthy meals. It is just sooo easy. I am always amazed at just how much flavor is packed into each can. I love that the tuna is ready to go as soon as it is opened. 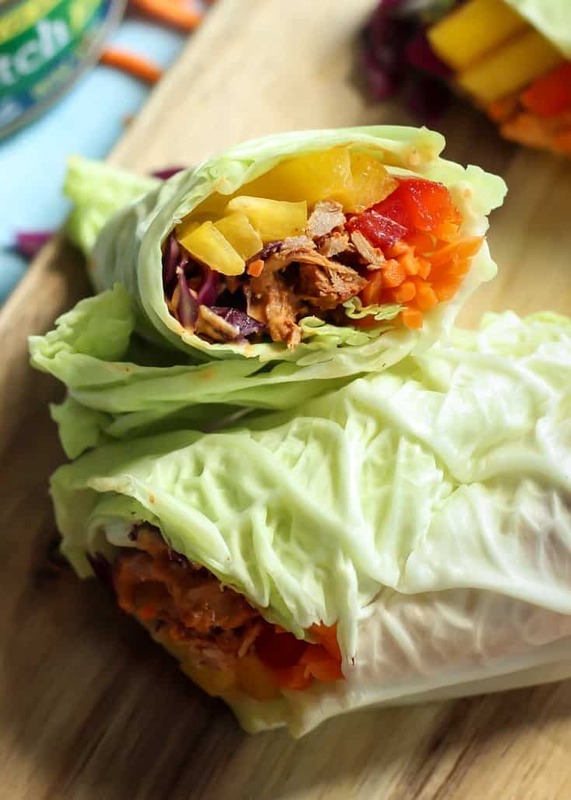 I used the Chili Lime Tuna to make these Napa Cabbage Wraps. YUM. It just takes a little bit of prep work with cutting the veggies, but all in all simple and quick. I also made a simple cashew curry sauce to go inside the cabbage wraps. Just cashew butter, red curry sauce, lime juice and coconut aminos. Plus water to thin. Cashew butter sauces with these types of meals are my favorite. If you haven’t tried pairing wraps like this with a cashew butter sauce, you’re missing out. Another thing about this meal is that it is gluten-free, dairy-free and paleo. It’s really just loads of veggies, tuna, and that cashew curry sauce. You could definitely add these to your meal prep lineup (if meal prepping is your thing) and have an awesome lunch or quick dinner ready to go during the week. 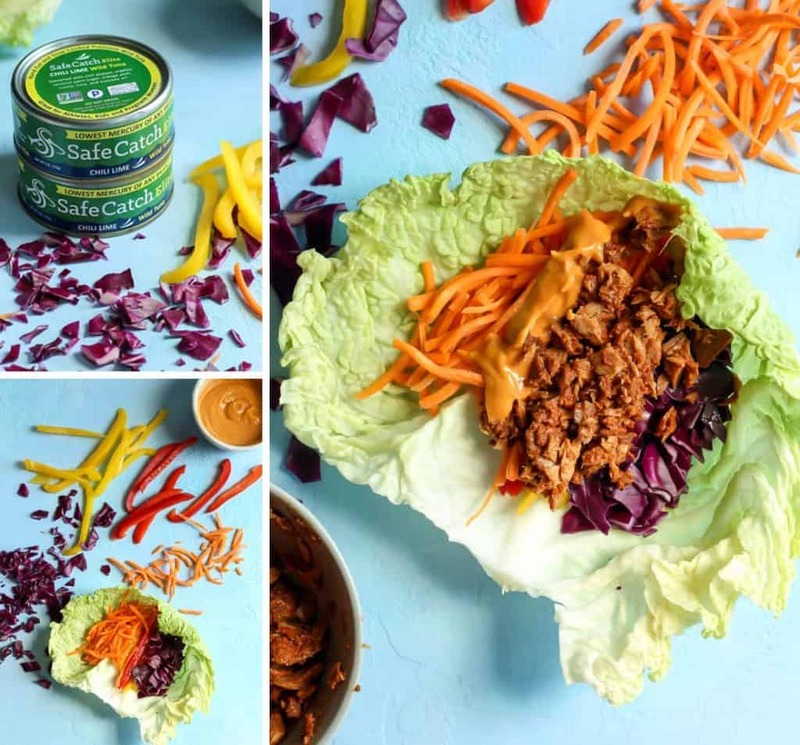 And if you’re looking for a Whole30 friendly option, just simply replace the Chili Lime seasoned tuna with the unflavored tuna, and mix in with the cashew curry sauce, before adding into the cabbage wraps. I hope you enjoy this healthy and simple, yet satisfying meal! 1. Open cans of tuna, making sure not to drain the juices (this is the seasoning and flavor!) and transfer to small bowl. Mix with fork, set aside. 2. Rinse the napa cabbage and gently pull off leaves. Pat with paper towel to dry. Set aside. 3. Make the sauce: in a small bowl combine the sauce ingredients with whisk or fork. Thin with water, 1 tablespoon at a time, as needed. 4. Assemble the wraps: gently pull apart the cabbage leaves. Add the carrots, purple cabbage, bell peppers, about 1/4 cup of tuna and end with about a tablespoon of sauce. Gently roll up the cabbage, securing with toothpick if needed. 5. Repeat with remaining ingredients until you’ve used up the tuna. 6. Dip cabbage wraps in remaining cashew curry sauce. Enjoy! Store remaining cashew curry sauce in covered container in fridge up to one week. Tip: Use leftover sauce in buddha/power bowls or as salad dressing. These look SO good! Perfect to make for lunch at work. Love it! My husband would love these, too! These look amazing! I would love to make these for my family. Love love love Safe Catch!! I tried their Tandori flavor recently and it was so good. Can’t wait to try these wraps! To be *totally* honest tuna is one food I just can’t eat. My hubby loves it though, and always eats packets of tuna when we go camping! Chili lime sounds like an amazing way to mix up regular tuna salad. What a great lunch idea! 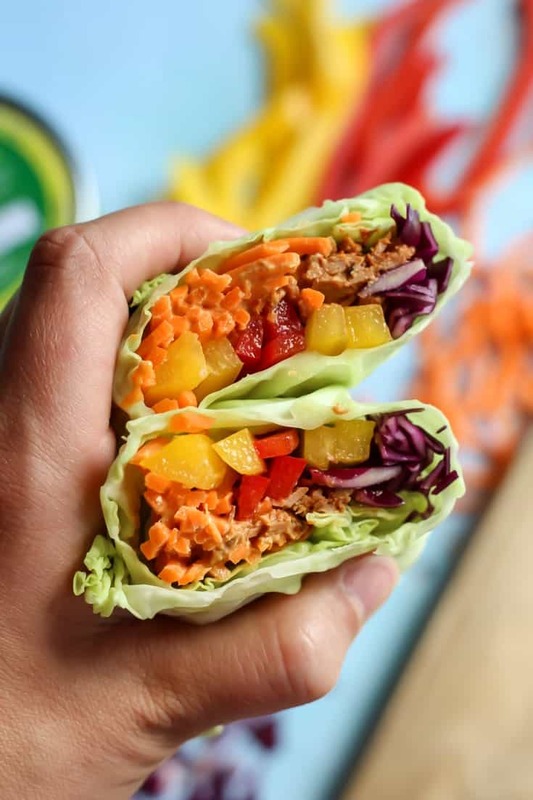 These wraps looks so delicious! Would love them for lunch! Can’t wait to try these soon! What I need is that cashew curry sauce like right now. I think I could wrap anything in cabbage and it would taste good with that sauce! Sounds so good, thanks for sharing it! These are so pretty to look at and they look so good! I cannot wait to try them out! You had me at chili lime!!! This looks incredible. I need to try this tuna!!! I had no idea they made flavored tuna! Love these wraps, too – so fresh!